When you are at the threshold of Masjid al Haraam in Mecca, the Kaabah is before you. An enormous courtyard and in the center, a hollow cube. Here, there is nothing. Nothing to even see. An empty room, that is all. There is nothing here. There is no one here. The cube faces all, faces none, everywhere, all directions and yet, no direction. But wonder! To the west of the Kaabah is an addition, changing its shape and giving a direction to it. What is this? A short, arched wall facing the Kaabah. It is named the Hijr of Ishmael! Hijr means skirt! And it actually resembles a skirt. The skirt of a dress, the dress of a woman. An Ethiopian woman. A slave! A black slave. The slave of another woman, Sarah, wife of Abraham. A slave, so humble, that the other woman chose her as her husband’s mistress. That is, she was so abased that she would never be considered as being a rival wife. A woman who, in human systems, lacked every dignity, every honor, and then God united the mystery of her skirt with the mystery of His existence. This is the skirt of Hagar’s dress. The skirt which nourished Ishmael. Here is Hagar’s home. 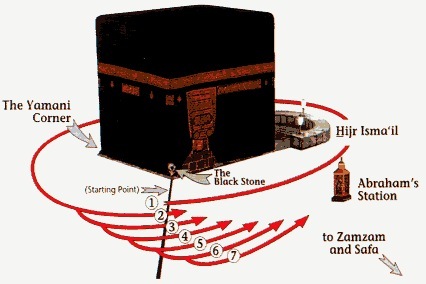 Hagar is buried near the third pillar of the Kaabah. Amazing! No one, not even a Prophet should be buried in the mosque. And here, the House of God, wall to wall with the house of a female slave. And the House of God, the burial place of a mother. God’s non-direction is only directed from her skirt. The Kaabah has extended towards her! Circling around the Kaabah, the mystery of monotheism, without circling around her skirt is not accepted. All of humanity, all who have accepted God’s invitation, should circle around the skirt of her dress as well. Her house, her grave, her skirt, also, are part of the tawaaf (circumabulation), are a part annexed to the Kaabah. For the Kaabah, this absolute, non-direction is only directed towards this skirt. The Kaabah is directed towards the skirt of an African slave, a good mother. The God of monotheism, seated upon His Omnipotent Throne, He is Alone. But it seems as if from among all His creatures, in His infinite Creation, He selected one. A black female slave of a woman. The most humiliated of His creatures. He has placed her beside Himself, a place beside His House. Becomes her neighbor. This entry was posted in Classic Teaching, Navid Zaidi and tagged Ali Shariati, Hagar, Ishmael, Kaabah, religion, spirituality. Bookmark the permalink. What a beautiful story. I remember the slave of Abraham who bore a child for him. What was her name? Yes, that was Hagar (Hajra), and the son she had borne was Ishmael (Ismail). Thank you, Memory is starting to come back.